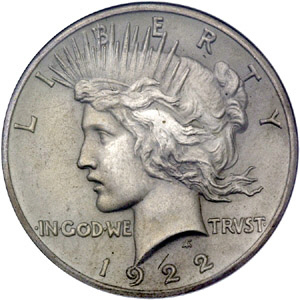 1921 – 1935 Peace Dollar is 90% silver. Use the Silver Melt Value calculator to see the value of silver in this coin. The Peace dollar was minted from 1921 to 1928, and again in 1934 and 1935. Designed by Anthony de Francisci, the coin was the result of a competition to find designs emblematic of peace. The Peace Dollar reverse design depicts an eagle at rest clutching an olive branch, with the legend “Peace”. The Peace Dollar was the last United States circulating dollar coin to be struck in silver – 90% silver. It’s feature of 90% silver makes this coin part of the Junk Silver status, a term used to describe the value of silver exclusively.